Firstly, just a quick recap on what Optus Loop is and end goal benefits for your business. Optus Loop is a cloud based pbx (unified communications) system. This means the pbx is located on virtual servers in the cloud (i.e. a datacenter) as opposed to your traditional on-premises PABX i.e. the big telephone box located in your office that no-one dares to go near. Although Optus Loop cloud based pbx operates in the cloud, your handsets will be plugged into your existing office data sockets in your office connected back to your existing internet connection, and should you be considering Optus Loop, its recommended you check your upstream and downstream rates on your current internet connection to ensure your phones don’t run into any dropouts, jitter or call quality issues. How Does Optus Loop Work? Once your Optus loop handsets are installed and plugged into your office data sockets, they will automatically look for Optus’s cloud pbx server IP addresses and attempt to connect. Before all the magic can happen, upon sign-up, you will receive multiple e-mails from Optus Loop including your username and password, so you can login to the Optus Loop Login Portal . By logging into the Optus Loop Portal, you can make modifications to your phone system. Perhaps you want to add auto attendant or add a night switch, so callers get a message after hours, there are many, many features you can add and customize to your small business requirements, of which you can view on Optus Loop website. 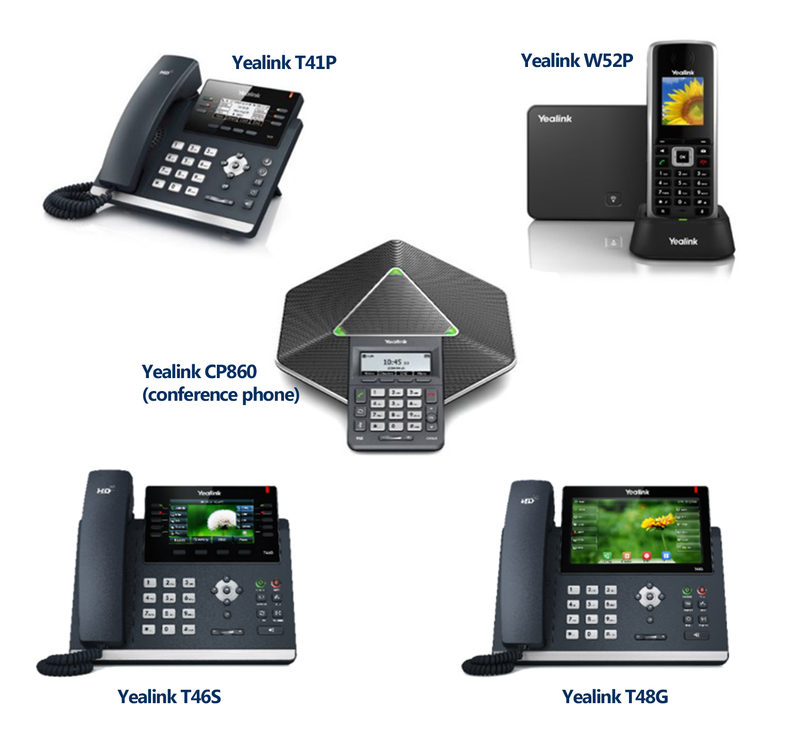 Optus supplies various IP handset models from the Yealink range. 3 handset types you will be offered are wired, wireless and conference phones for your meetings. Obviously, dependent on your business requisites you may wish to mix them up with wired and wireless Yealink handsets. The mother of all handsets Optus offers is the Yealink T48G, this particular premium style handset incorporates a big touch screen, video chat and tons of productivity-enhancing features too. Although, this handset comes at a price. Don’t panic, the Yealink T41P is considerably cheaper however still the perfect option for your business unified communication solution. Can you use Optus Loop with your existing PABX system and handsets? Yep. So, if you have an existing PABX system, you don’t need to upgrade your system to utilize all the cost benefits of Optus Loop. You can ask your Optus Loop representative for providing you a carriage service only of which they will deliver via an ATA (analogue telephone adaptor) device which will hand off standard PSTN lines. One particular downfall is you need to ensure your current phone system has the relevant cards installed to accept the incoming PSTN lines. Depending on your current telephony solution, you maybe using ISDN or some other delivery type, which means your PABX might need extra cards which translate into extra costs, contacting a telephone maintenance company which specializes in your brand PABX. Our recommendation is, if you don’t have an existing phone system or your phone system is a few years old and not capable of accepting SIP/IP trunks, then why wouldn’t you go with the Optus Loop provided handset option, it is a much simpler unified approach. Can Optus Loop Support Fax Machines? Yes, Optus loop provides T.38 Fax Support. T.38 is a protocol for relaying high-speed facsimile transmissions over IP. Optus provided ATAs supporting T.38 are validated and tested; Analogue faxes can be connected to an ATA line associated with a Optus Loop station. As Optus Loop service has multiple components including voice, video, desktop and mobile applications, web applications, and service quality tools. These components require communication between devices on the customer’s local or wireless network connections and servers within Optus’s cloud infrastructure. For this communication to function properly, customer security devices, such as firewalls, must not block IP addresses and TCP/UDP service ports used by the Optus Loop service. Be sure that your firewall has been configured to allow all required IP addresses, TCP and UDP ports for your new phone system to work properly. 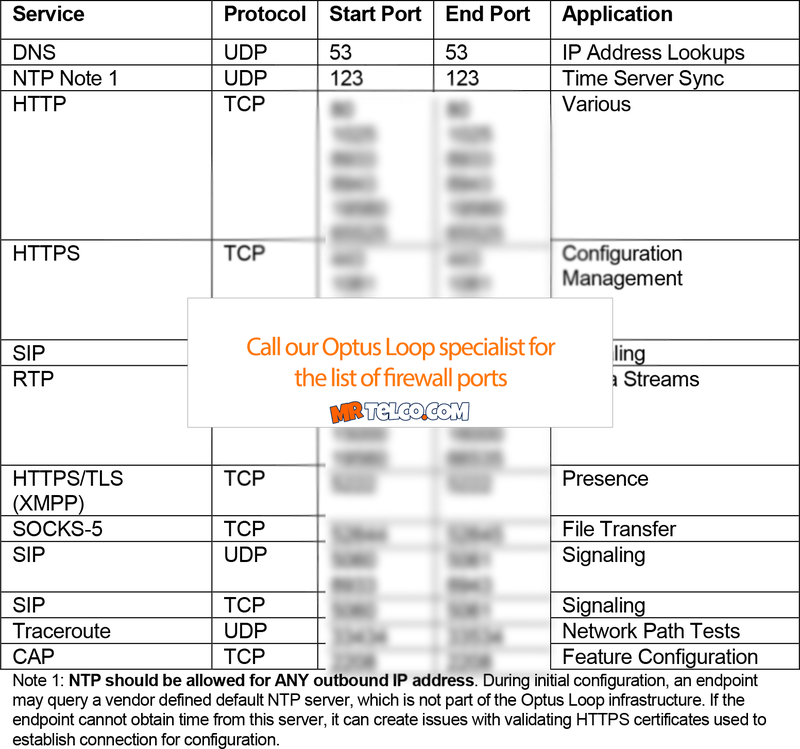 If you need assistance with the required IPs and ports to allow for Optus Loop, reach out to our team requesting to speak with the Optus Loop installation expert. Our recommendations: If your existing business internet connection is intermittent or struggling with upload/download speeds as it stands, you may wish to consider adding on an Optus 4G Huawei router to your Loop pbx and handset package. From our experience, these Optus 4G routers pump out more than enough bandwidth for the average small to medium office size whilst accompanying 1 – 20 Optus loop handsets. Optus are offering around 100 – 200GB per month on their data plans and the best part is they waive the bandwidth used from the pbx system, and only counting towards your office data usage. Optus 4G data connections are perfect as an NBN competitor or SMB connection whereas some businesses pay 200-500 dollars per month. You may wish to swap your current internet connection out with the Optus 4G or simply run the new service parallel with your current service. There are certainly some creative ways to achieve this, including adding a load balancing router, or your can keep it as cost effective as possible and just direct all your Loop handsets to the 4G router. Learn more about the Optus 4G router capability and technical detail here or pick up your phone and ask for one of our cloud pbx specialists that has experience with the Optus Loop product. One of the major benefits from our installation experience as technicians and overall review of the Optus Loop IP PBX unified cloud solution is that it meets all the demands of the small to medium business. Its super simple to use once installed, and many benefits from functionality and cost perspectives can be achieved, especially for business moving away from traditional PSTN or clunky PABX telephone systems which are super expensive to maintain, and many customers get ripped off with being quoted for up to $10,000 or more for installation and ugly long-term maintenance agreements they can’t get out of. Unified communications by Optus are certainly a way for small business to tackle those ugly old school sales tactics from big name brand ISP PABX resellers. Optus Loop are a good Telstra DOT alternative and should not be looked past. Probably one of the more noticeable cons from an installers perspective of Optus Loop is that some customer networks are a little complex and may need the assistance of the company IT guy, especially when the larger customers have multiple routers, vpns and using load balancers as part of their network, although they can be resolved, it takes ingenuity and a little help with your IT team. Our last noticeable con would be having enough data sockets in the right locations, so this may require data cabling installation which will be noticed by the technician during a site audit prior to installation or port date. Overall, a great product and well worth it for any small to medium business 1-40 handsets, including multi-site rollouts. The best part about Optus Loop is, if your business decides to relocate you can simply unplug your handsets and take them to the new premises and plug them in ready to go. No need to wait weeks bouncing back and forth with your ISP waiting on porting and all the headaches that are presented during these stressful times. Final note, be sure you have enough data points near your desired handset location, otherwise there are alternates like wireless handset which may get you out of trouble. Good job Optus, and one of the much needed uc small to medium business phone systems Australian business are looking for. Need assistance with your Optus Loop setup or installation?